Three years ago, I taped four pieces of paper to my bedroom door. Before I face the day, I come face-to-face with a calendar from 2016. Here we are at the close of 2018, and I’m still standing in front of these pages, stumbling out of bed and rubbing sleep from my eyes on a chilly December morning, whispering the words I know by heart. I said it this morning. I’ll say it again tomorrow. Through the highest of highs and the lowest of lows, those words of truth have been a constant and a comfort. When I don’t understand and I can’t see what’s coming next . . . I can trust everything He does. When I feel unsure and alone . . . He goes before me and behind. When I’m overwhelmed . . . He gently reminds that it’s my heart that He wants, not my performance or a completed to-do list. When I’m worn out or searching for a light in the darkness . . . He is my hope. I desperately need that to be true. I need to believe that He’s making a way and clearing a path. I need to believe that He’s redeeming all things for good, even when I can’t see it just yet. I need to believe that He’ll be with me no matter what tomorrow may bring. December will fade into January, and we’ll put the ornaments away as the year wraps up. We’ll look toward the future with hope or fear or a mix of the two. After all, seasons change and jobs shift and we pack houses and close our books after finals end. We say difficult goodbyes and joyful hellos and eventually winter will turn to spring as change comes again. But through all of it, He remains. His love is constant, sure, secure — unchanging. He didn’t stay in the manger and He didn’t stay in the grave, but He did promise to be with us through every high and low. 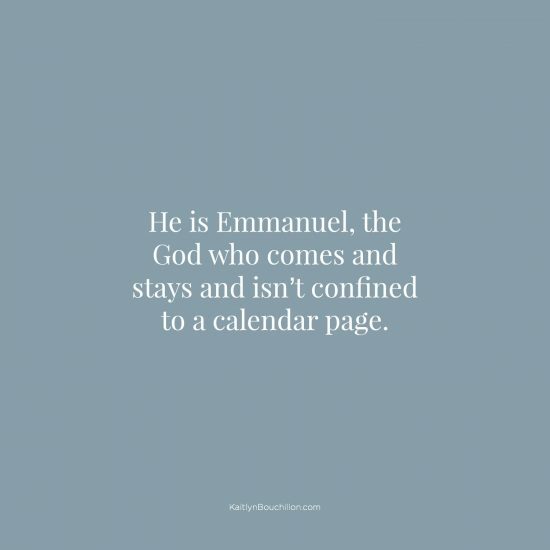 He is Emmanuel, the God who comes and stays and isn’t confined to a calendar page. When winter melts into spring and the places that seemed barren and empty suddenly explode with life and joy . . . Emmanuel, God with us. When the days stretch endlessly on and the sun beats down and it all seems like one long cycle of wash-rinse-repeat . . . Emmanuel, God with us. When the leaves fall and our tears fall and everything around falls apart . . . Emmanuel, God with us. When hope is buried deep and yet all is washed clean as the world quiets and learns to wait with anticipation . . . Emmanuel, God with us. 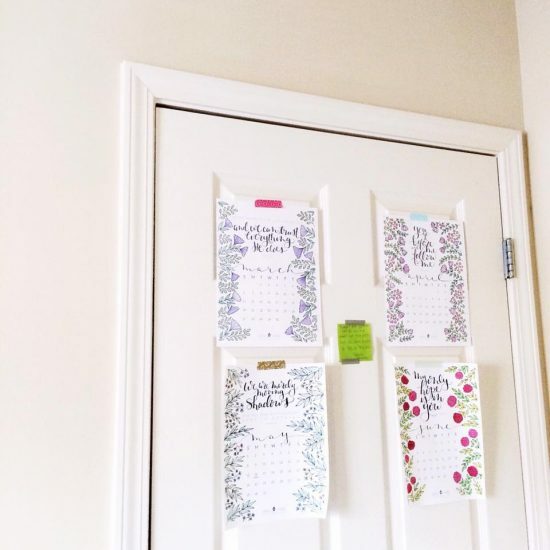 Bitter and sweet, laughter and mourning, darkness and light, dead ends and new beginnings and messy middles full of ordinary days — in all of it, there He is, faithful as always. He is the way-maker and the promise-keeper and so although we may not know what’s coming our way and 2019 may hold more questions than answers, we can trust that He’ll be with us through every change. Look before you, He is making a way. Look behind you, He has been there the whole time. Look to your right and to your left, He is with you now. 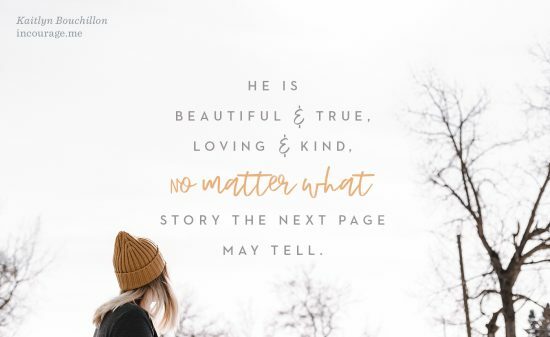 May we dare to say that He is beautiful and true, loving and kind, no matter what story the next page may tell. May we trust the unknown of the future to the God we know is authoring its pages. Here’s to 2019, to new beginnings, fresh mercies, a blank page and an unchanging God. I’ve repeated words similar to these for so much longer than I expected to, and I continue because although I can’t see the truth of them yet, I know it is there…He is there, and He is working. This is our faith in action, and each time we share it builds up another. He truly is our Way-Maker…our Day-Maker…each and every one. I am so grateful. The Psalm’s verses are absolutely beautiful and uplifting. So glad I cam by as I am so much more encouraged. Wonderful promises from our God to hold close. You inspire by going to these verses each morning. God is faithful! This is such a great post, Kaitlyn! I am truly blessed and encouraged by my visit here today. Thank you so much for sharing with such transparency and hope! I’m so glad. Hope you have a great 2019.